Kitchen Decor and Kitchen Storage | P.C. Fallon Co.
Shop our selection of favorite stylish and functional accessories for the kitchen. We've assembled a selection of charming pillows, lovely lighting, trays, stools, benches, hooked rugs, and more. Keep gleaming galvanized metal trays or burnished copper finish trays at the ready so you can serve drinks in style - or perhaps take your snack supper to the sofa. 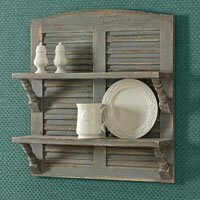 Artfully corral the days mail and your keys in a reproduction treenware trencher, so true to the coveted original antiques that it even sports a repair patch. Tuck a bench next to your counter so you can find a roost while you peruse a cookbook and plan your menu. Stash a few extra bottles of wine in a handsome wine rack crafted of horseshoes.